Since its initial launch in late 2016, Smart Links has saved countless hours for partners worldwide by eliminating the need for manual personalized link generation. Now, in addition to monetizing all eBay links on your site with your own unique tracking information, Smart Links also enhances those links with compelling mobile ads. Since the feature’s debut earlier this summer, partners are seeing increased conversions across all mobile devices. And, as more partners set their sites to continuously optimize with Smart Links, we’ve begun to receive some questions about how the mobile ads work and why ads aren’t displayed for every eBay link on a page. 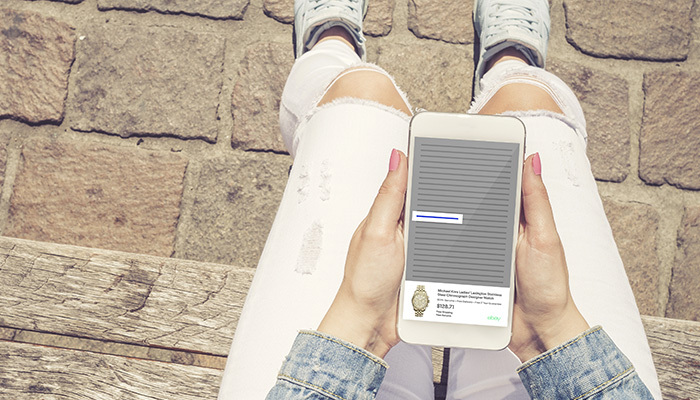 As your audience absorbs your content, these mobile ads display naturally for a brief 15 seconds and can be hidden from view if the user prefers. Non-invasive, they rise up intuitively from of the bottom of the screen when your buyer stops scrolling, and they disappear after your buyer scrolls again. It’s important to know that this feature currently only works for single item listing pages. These are the pages that present only one listing, as shown below. The mobile ads feature was released network-wide, which means that everyone who already has Smart Links now has the latest release and can capture more mobile conversions. So, if you’re looking to optimize for mobile and already have Smart Links in place, you’re off to a good start! If you don’t have Smart Links yet, log in to the portal, visit this page and add the code displayed to your site. Once added, all past, present and future links to eBay on your site will be automatically monetized with your own tracking ID, and the links to listing pages will be optimized with mobile ads for your mobile visitors.